Hello there Peeps! I’m here today to share a great little Birthday card with a dimensional stack of flowers, a fun mason jar, and more layered Cricut cuts. 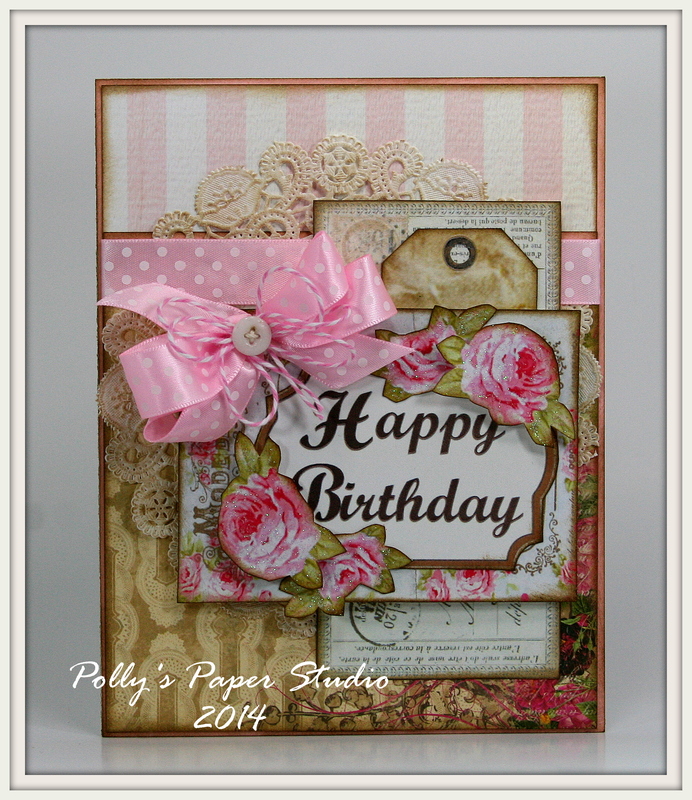 We’ll be creating this card as part of our class tonight. I’m looking forward to a night of crafty fun with my Peeps! 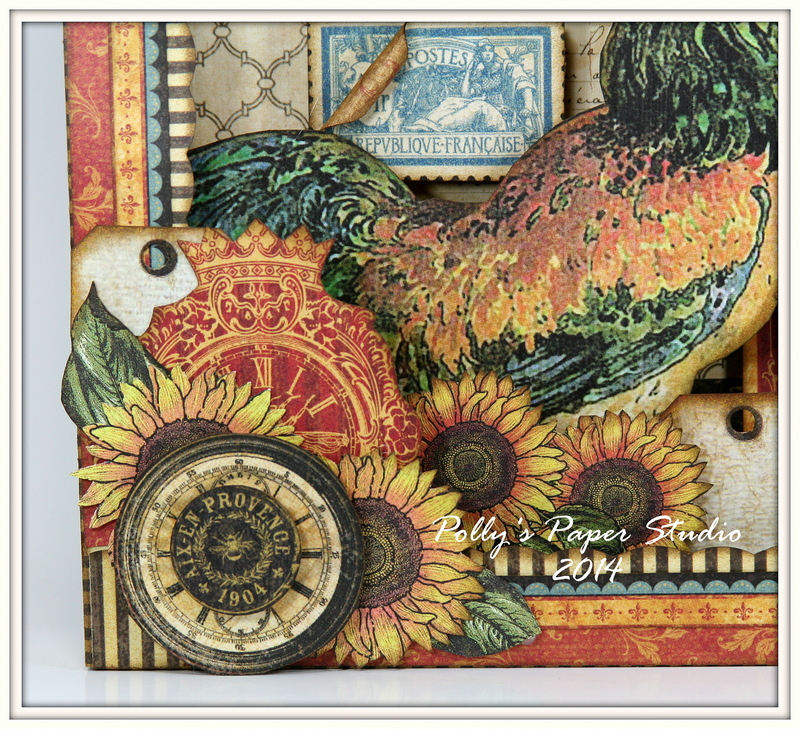 There are a few kits available for the 5 cards from this Variety Card class. 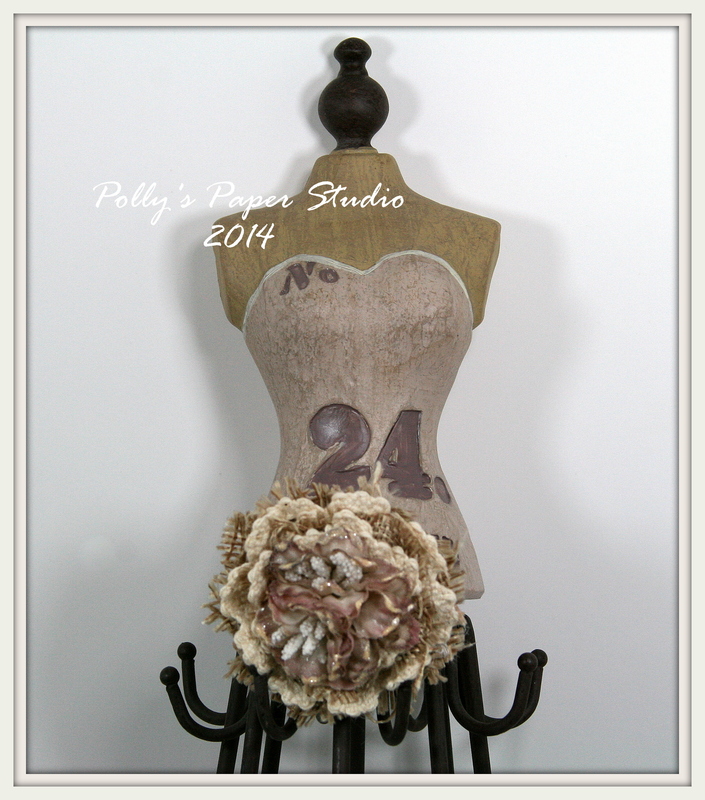 Check out Polly’s on Etsy for details. In other news…..we’ve got a fabulous new header for our facebook page……Like us on facebook to get sale and shop updates and lot’s of projects to get you inspired to get your craft on!!! Hello there Paper Peeps! I’m dropping in this morning to share a card we will be making in class this week. 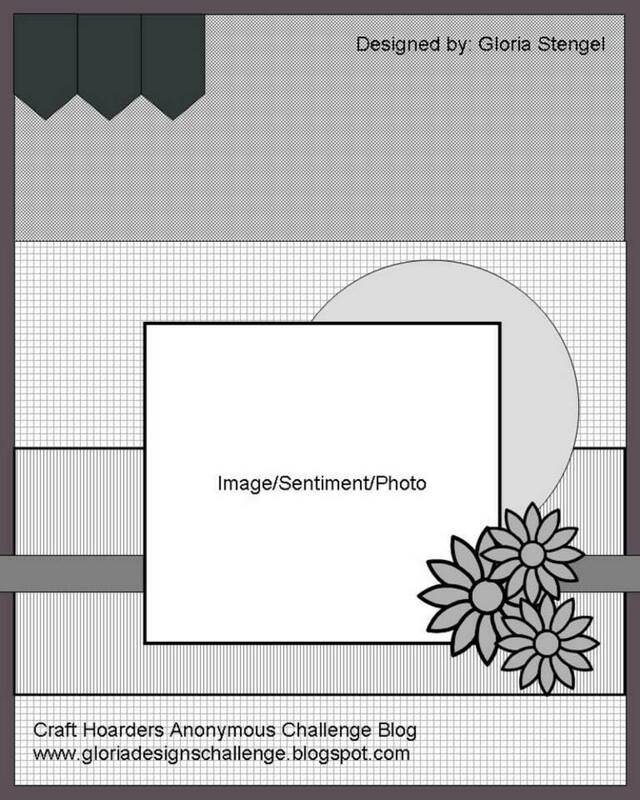 It’s one of 5 variety cards….this one is Thinking of You! We will also be creating a masculine card…good for Birthday or Father’s Day, a Happy Birthday card, a Thank You card, and a Wish card good for all occasions. 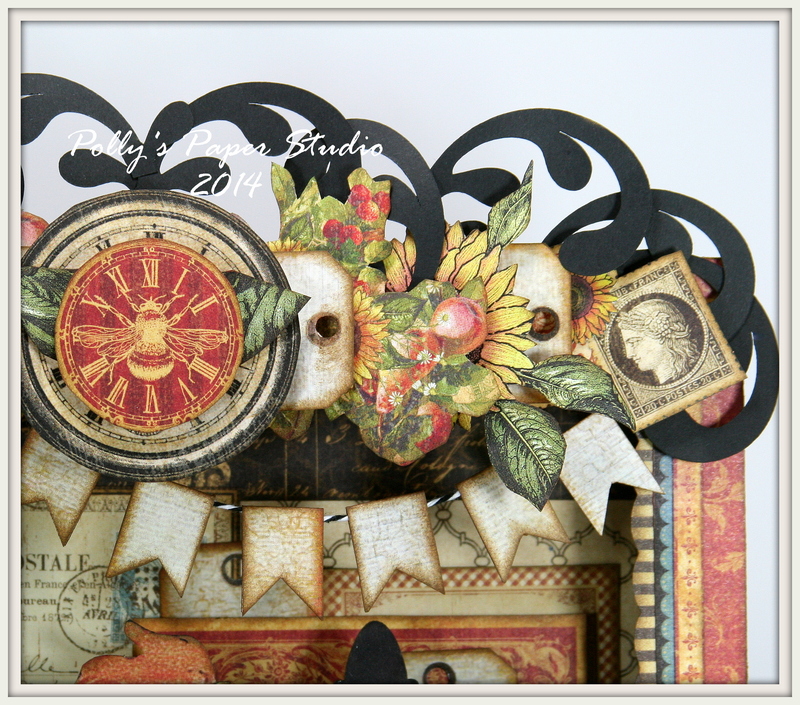 For this set of cards….I got a little crazy with the die cuts and embossing….eeeek. This card has a pretty little image from one of my collage sheets that I added a sweet sentiment too and Stickled for accent. 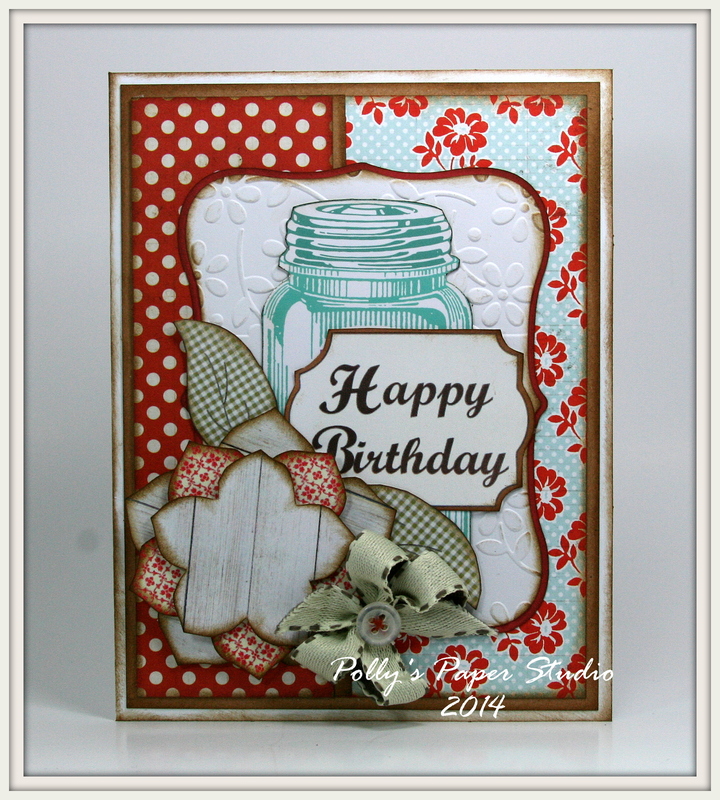 I layered it over multiple die cuts, lacy doily and beautiful blue checked patterned paper. I finished it off with a simple little coordinating bow. 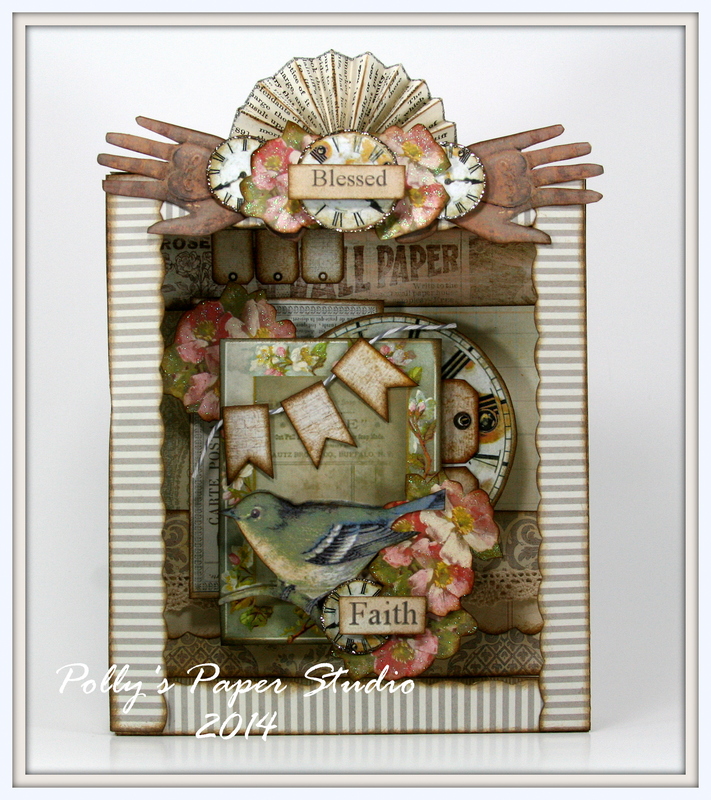 This class is full…but if you’d like to make the cards too…I have kit’s available in the Polly’s on Etsy shop. 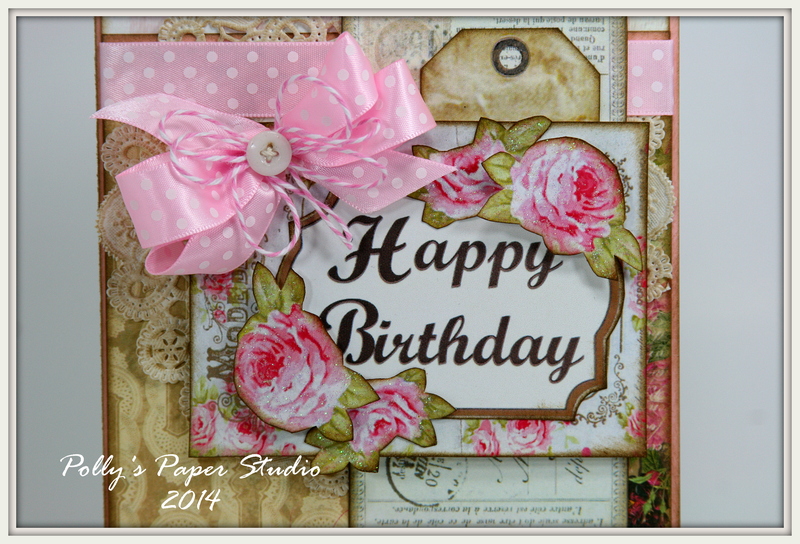 You can view the rest of the cards and get a kit so you’ll have a card ready for any occasion! Okay…that’s all for me today….I’ll be catching up on a little housework since I’m stuck in the house. My car is making a funny noise and my Hubby is off camping…so it’s a home day while I wait for him to get home and fix it : ) I’m wishing you all a happy and productive day with lots of time to be creative. Hey there Paper Peeps! 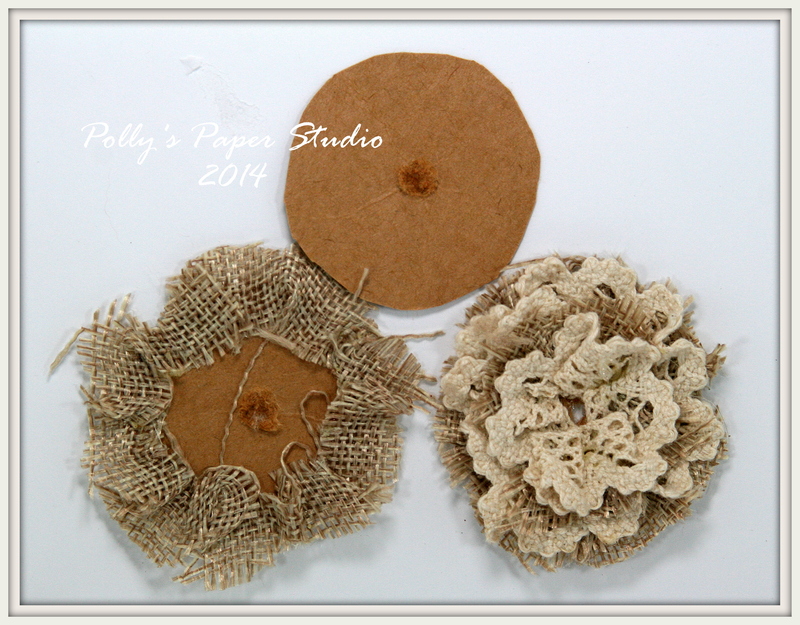 I’m just dropping in to share a fun and easy tutorial to whip up some great little flower, lace, and burlap scarf pins. These make great little gifts for Mother’s Day too! Make up a bunch of these cuties to have on hand and you’ll be ready with a thoughtful handmade gift whenever you need one. Did I mention they’re easy???? Isn’t that shabbylicious??? I think it would be pretty cute on a hat too!!! 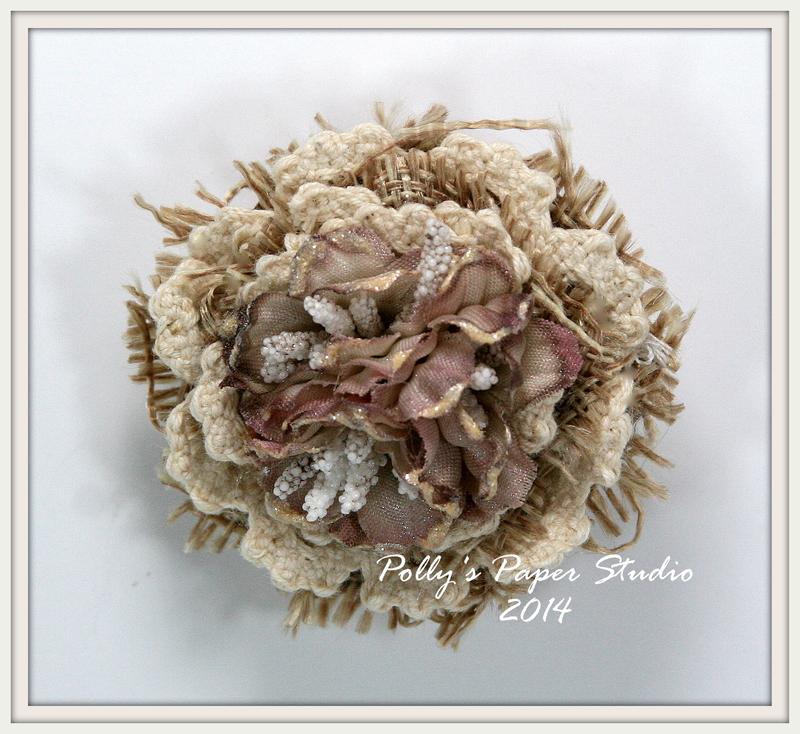 I have 9 artificial fabric flowers….nothing to write home about….but I like the size and shape. I used my blending tool and Victorian Velvet Distress Ink to give them some color. Next I added some Liquid Pearls in Bisque to the outer edges. While it was still wet…I sprinkled on Martha Stewart fine clear glitter. You can also add a little Walnut or Gathered Twig Ink to antique it like I did in the finished pin. 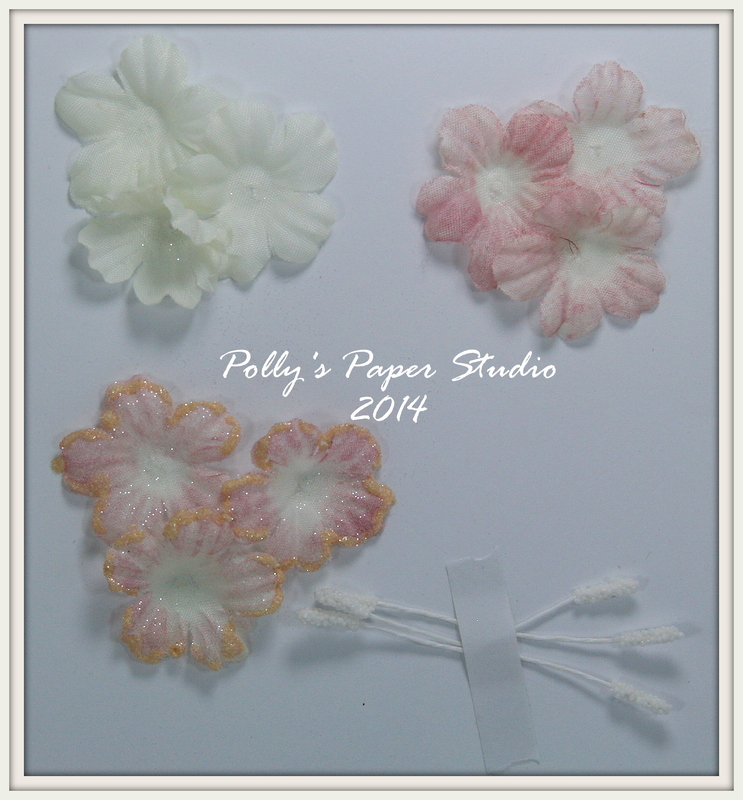 You will also need some flower stamens….these I found in the cake decorating section. 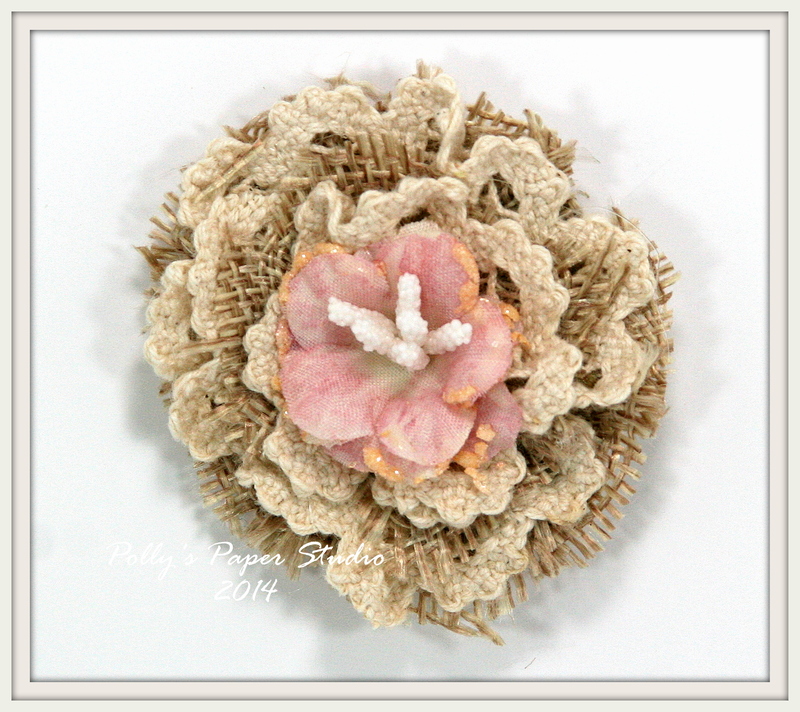 I layered three flowers and added three stamens to the center of each. Cut a circle from chipboard or other stiff backing material. I used an antique file folder since they are very thick and sturdy. Pierce a hole in the center. Trim Burlap from the wired edge and cut a scalloped shape on one side. Pinch pleat and hot glue the burlap around making sure to cover the outside edge of the circle. Add a layer of Crocheted Lace trim next pinch pleating the same as you did with the burlap. This took 2 layers of each for the size of circle and flowers I chose….you may like more or less layers. 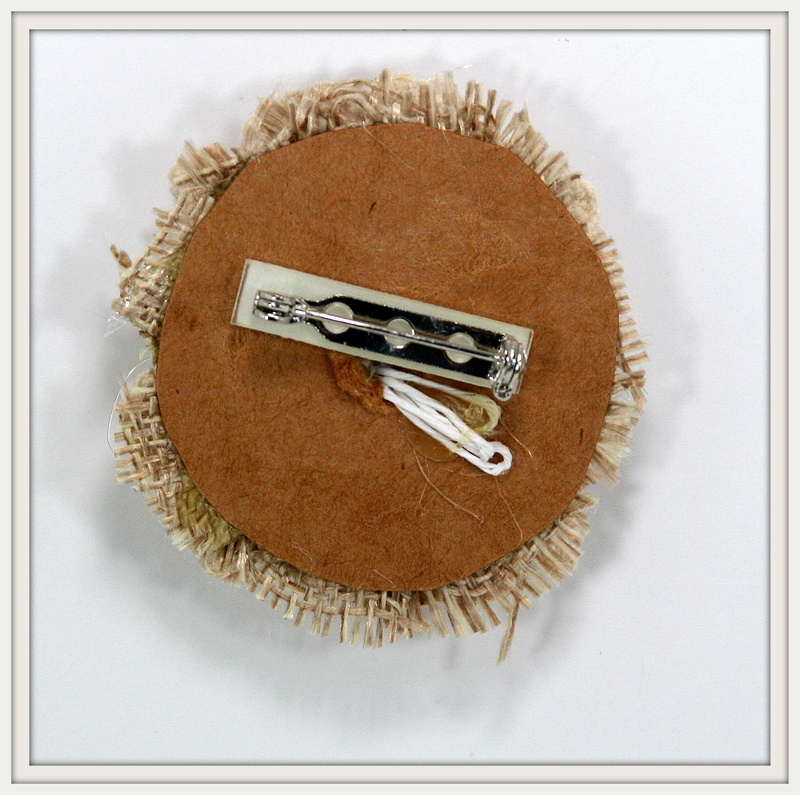 Begin pulling the stamens from the flowers through the center hole of the chipboard circle. You’ll want to add all three flowers before you secure the stamens on the back. I just squished the stamens into slightly cooled hot glue….still hurt : ( You could also use a wet adhesive like E 6000 if you’re squeamish about burning yourself. Add the pin back now. 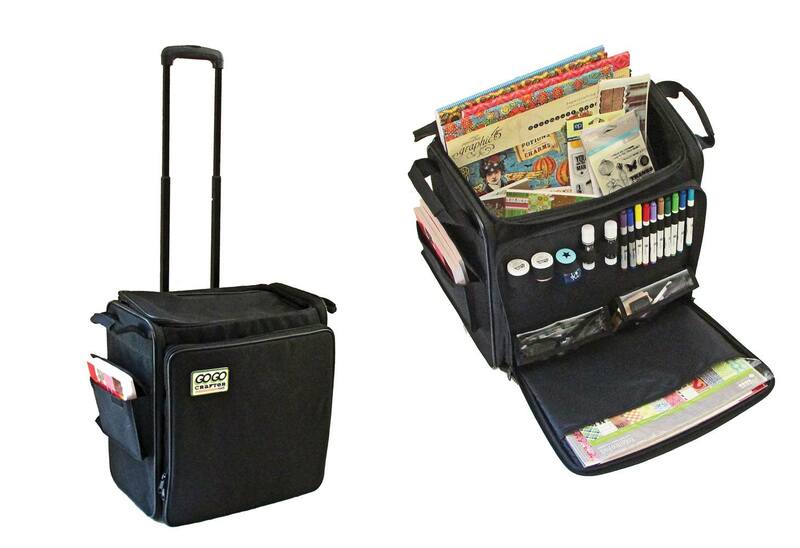 I found them at the big box craft store…very inexpensive for a fairly large package. These came with an adhesive strip….but I don’t trust that adhesive….so I added hot glue before securing it to the pin. Supplies used: Satin Swiss Dots Pink from Really Reasonable Ribbon. 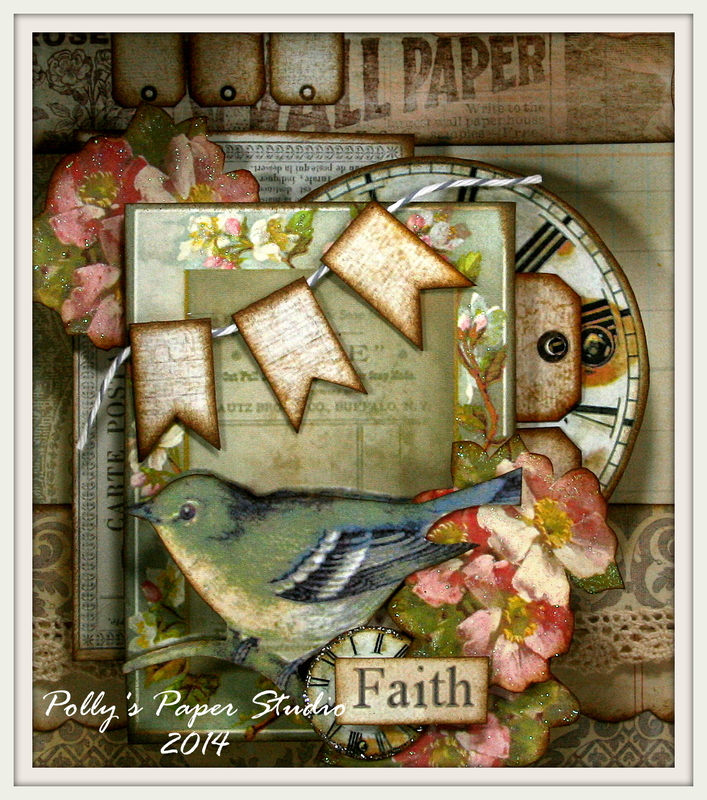 Cardstock from World Win, patterned paper from Hampton Arts and lot’s of printed vintage images. I added Gathered Twigs Distress Ink and Stickles for accent. Exciting News! And More Excting News!!! Hey there Peeps! I’m popping in with another quick post as we have so much awesomeness going on today! First big news…..
We made the team woot woot woot!!!!! I am so excited to be joining this awesome group of super talented designers. I am sooo looking forward to sharing lots and lots of fabulous projects with you on the G45 blog!!!!! More news?????? 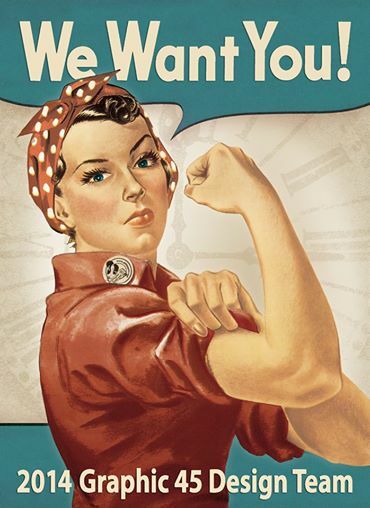 Oh yeah…bring it on! This has been a week full of real blessings. Oh and the weather has gotten so much warmer….Spring has finally arrived 🙂 Thanks for being a big part of #goteamginny I couldn’t have made it without you!!!! Good morning Paper Peeps! I hope you are enjoying your holiday so far….I know my kiddos have enjoyed having Spring Break the week before Easter! 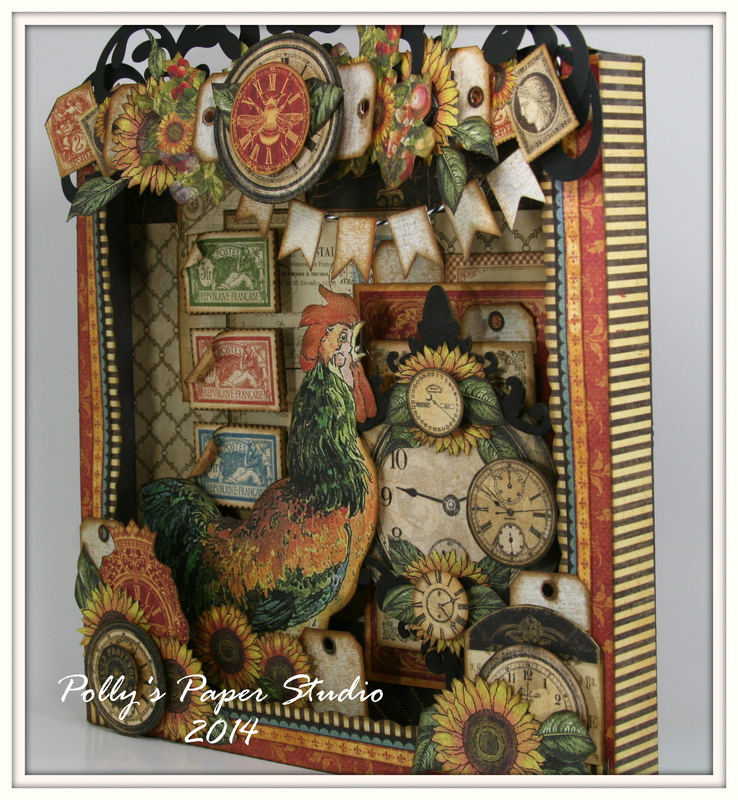 The weather is finally showing some signs of warming up and the grass is starting to get green….now if only the leaves on the trees would come out : ) I’m dropping in this morning before I head to the shop to share a shadow box collage I created yesterday. I am cra-zy over making shadow boxes now!!! 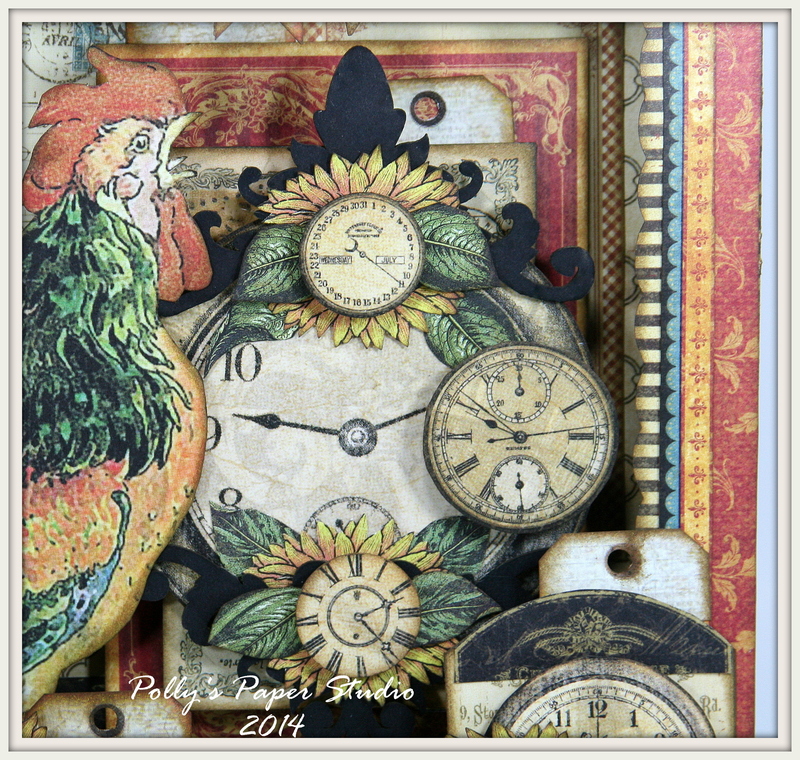 I used French Country patterned papers from Graphic 45 as well as some beautiful clock images from A Proper Gentleman. The box itself is 10×10 and I had so much fun layering in all the fussy cut images…and of course there is like elebenty hundred foam spacers so I could build in a lot of depth. These colors are so warm and sunny. 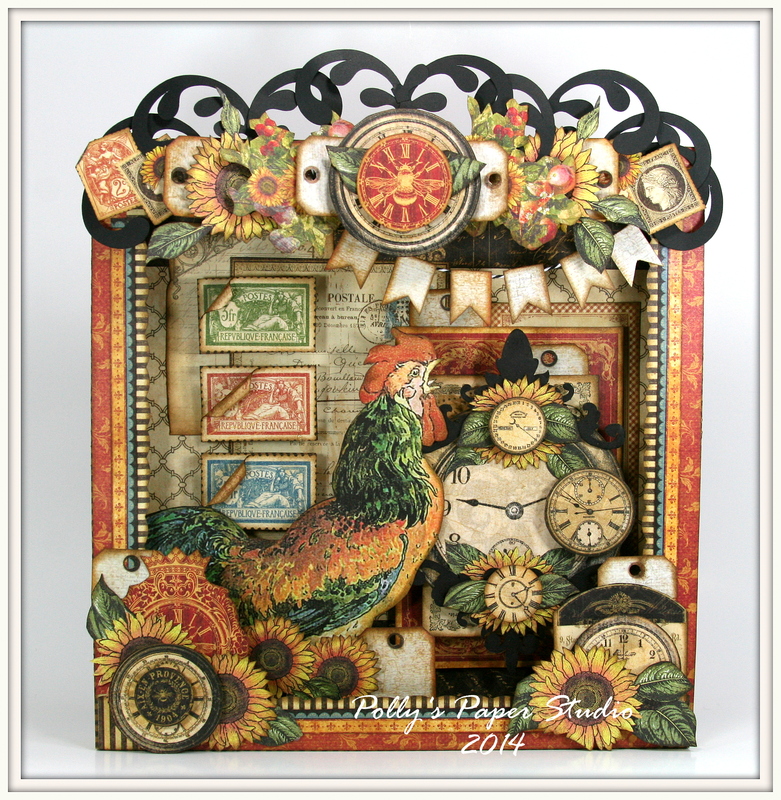 I used the clocks and the sunflowers to anchor the bottom corners. It never ceases to amaze me how well the papers from different lines coordinate so you can mix and match them to make your projects very unique. 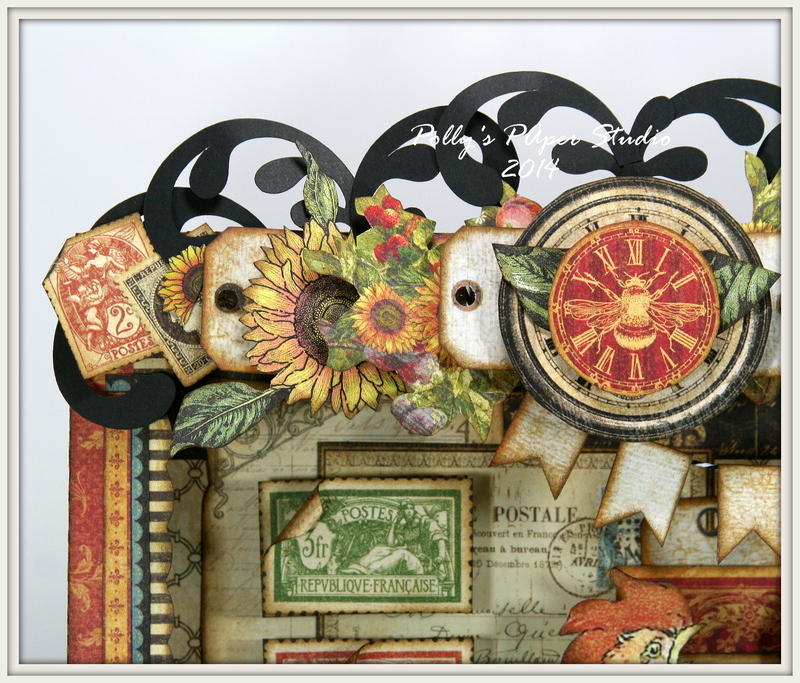 I added a striped scallop border to the box then layered on the border strip that came on the sheet. It suited my project better to arrange the stripes in a different order…so I trimmed them out and flipped them around so I would have the dark edge up against the stripe to keep it from being pattern overload. I am crazy about how this clock turned out. 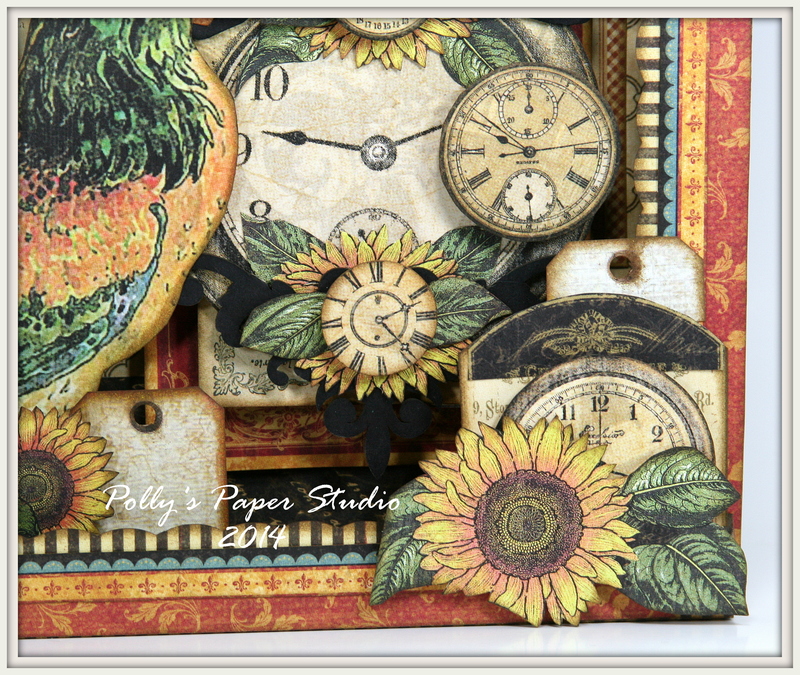 I added some inked Dusty Attic chippies the layered on more of the sunflowers and leaves and clocks. All along the top of the box I layered in fussy cut images with tags and more of the foam spacers. There are also lots of cricut cut scrollys that I worked in. To finish off this corner….a sweet banner hangs from Licorice Bakers Twine from Really Reasonable Ribbon. I cut doubles on the stamp images so I could add an extra spacer and roll up the corners.